Hello everyone and welcome! 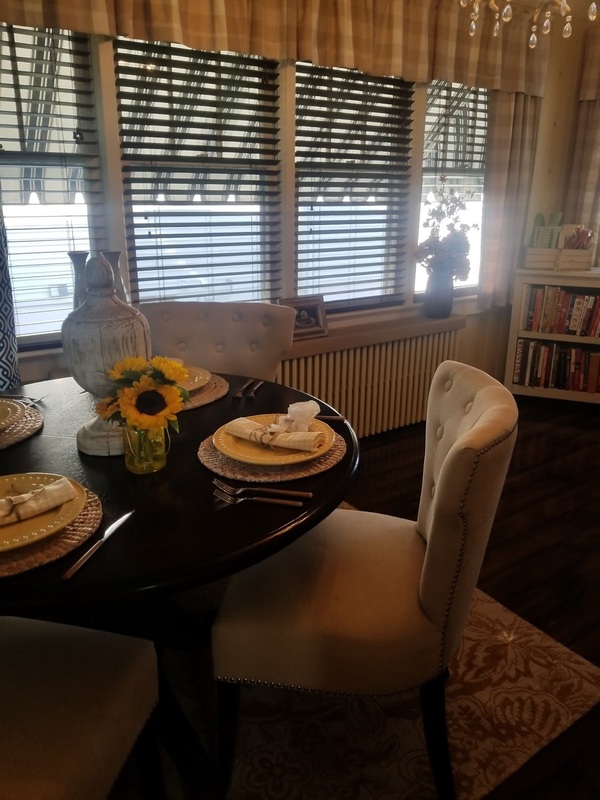 I have been busy working on the makeover of my home office and our Sun Room. The hard work is almost done... Well, as far as my work is concerned. I am still waiting on a couple of radiator boxes that our friend (Carpenter by trade) is building for these two rooms. The radiator cover swill also be benches and I know our little pooch is going to love it!! But today, I am excited to share our little breakfast nook with you all!! Nothing fancy or over the top. Just a bright and comfy room for us to gather, read the news and enjoy our early morning breakast. This turned out to be a larger project than expected. 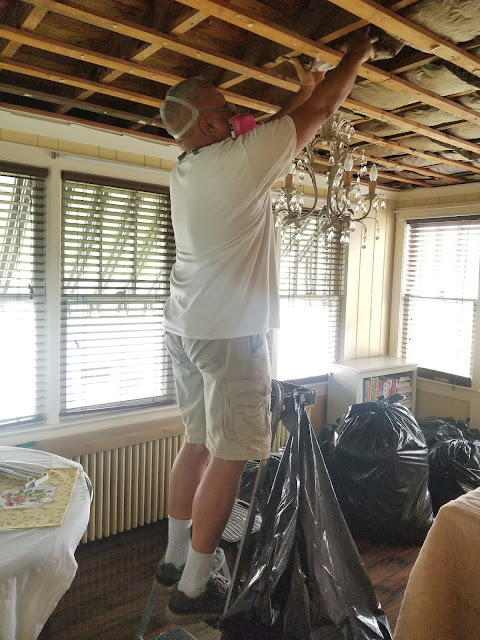 My poor hubby thought he was just replacing a few old ceiling tiles and it turned out that the entire ceiling had to be replaced. Having this project turn out more work than anticipated, I decided to give the entire room a much needed makeover. So, grab your cup of coffee or tea and get ready for the tour. 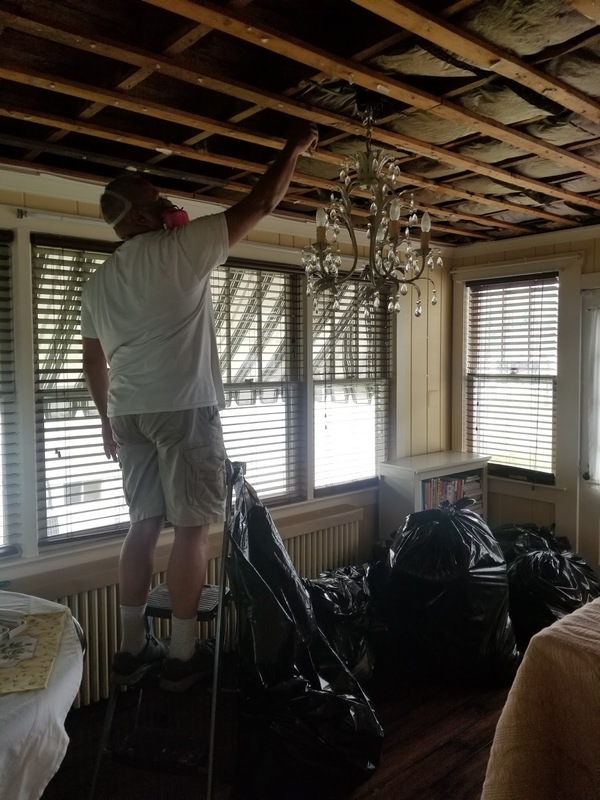 Before we begin, let me show you the room before the makeover. I know! I know!! So dark and dated. Not me at all... The room lacked personality, style and light. Now here is the after its fresh new look. What a difference! I am so happy and please with the results. It is much brighter and welcoming. And I love the combination of blue and yellow. 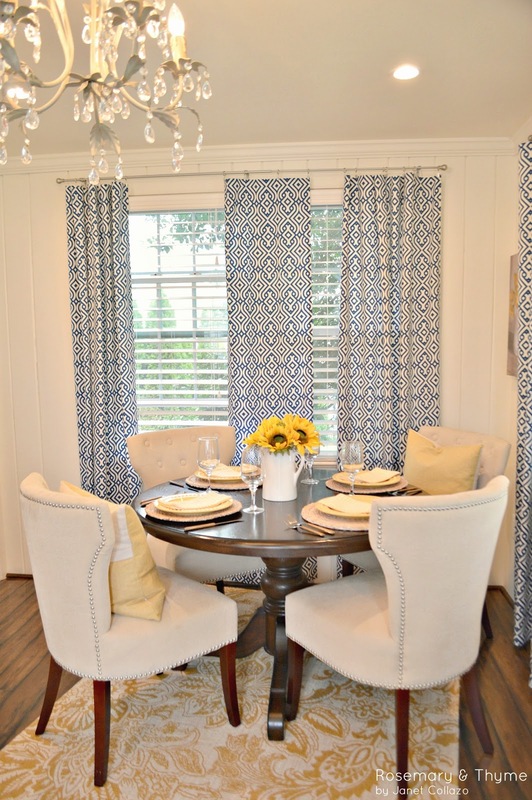 The inspiration for the room was the fabric that I used to make the window panels. I truly love this pattern. It is modern and adds a fresh vibe to the room. I also replaced the curtain rods for one that have the clip rings. This allows me to easily change the panels whenever I am ready for a new look without too much fuss. I must admit, this room really makes me happy now. I just can't believe it took me this long to do this makeover!! The table and chairs are ones we already owned. 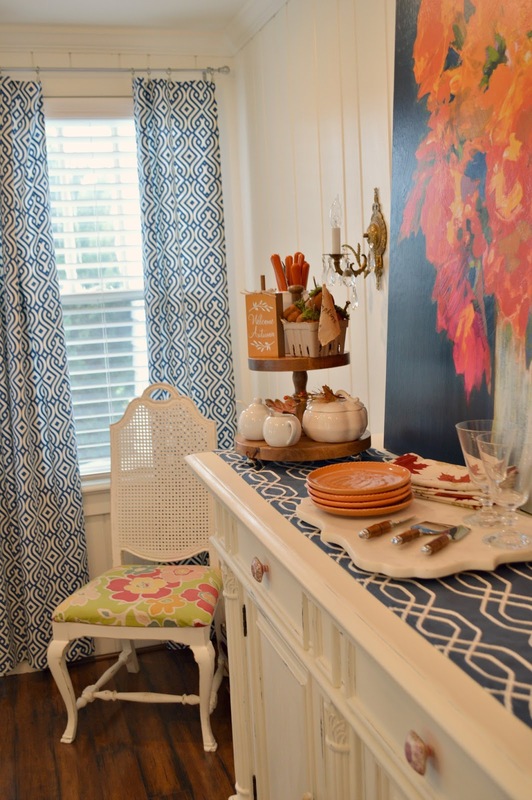 A quick change in color of the accessories on the table and wall made all the difference. 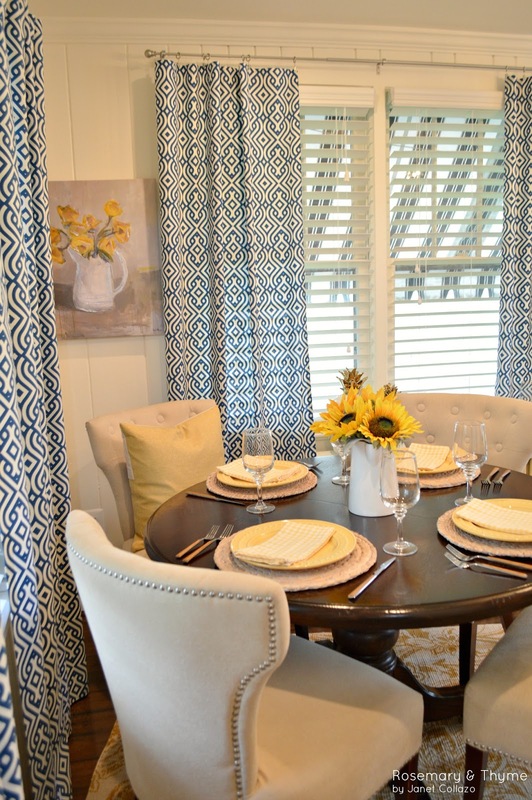 This pretty yellow was the perfect match for the blue that is on the window panels. Both add charm and give the room an airy feel. Most of the items pictured on the table and wall are from Home Goods. Again, this was the old dark unit that we had in the room. A new piece was achieved by changing the color. We used two Annie Sloan chalk paint colors to get this creamy white color. Funky hardware was added to make the piece current. The pretty chair on the corner was a thrift store find which also received a makeover with a fresh coat of paint and new fabric. 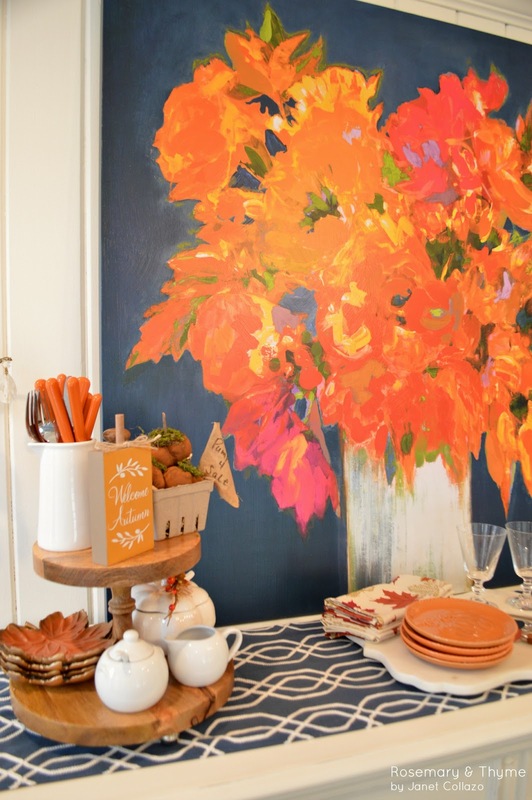 An oversized piece of artwork in bold shades of navy blue and orange brings drama to the room. We decided to go with a bright color for the walls. This old dark unit received a makeover too. A fresh coat of paint and new knobs gave it new life. 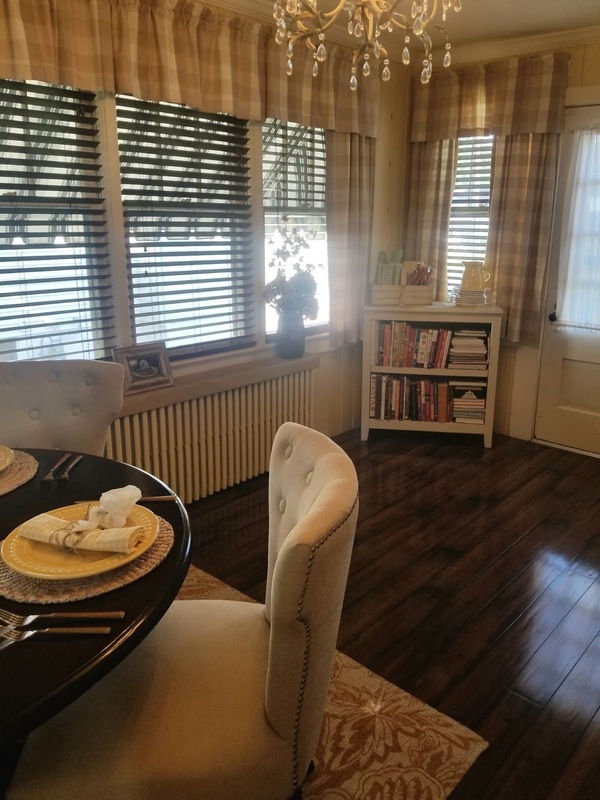 I hope that you have picked up an idea or two and hope that you are feeling inspired after the tour of our Sun Room. 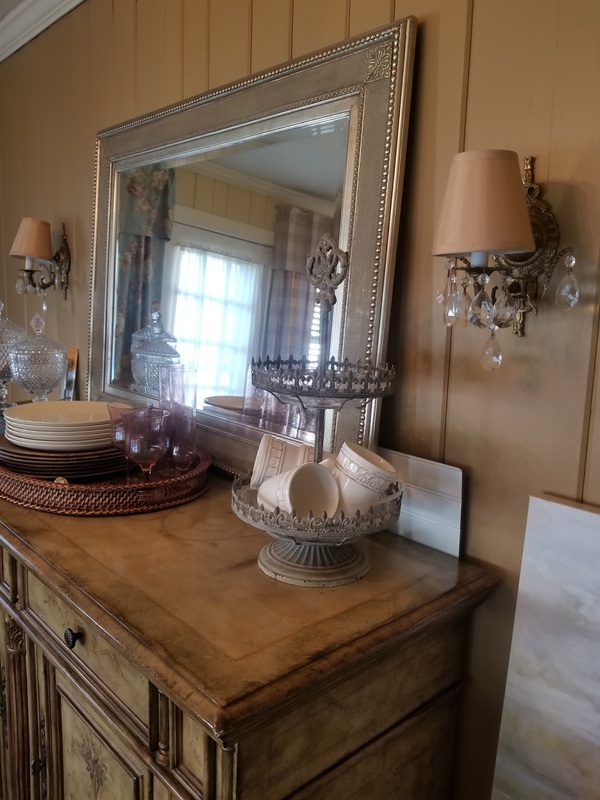 It is always an exciting to refresh our homes. Especially when the work is done of your own hand. 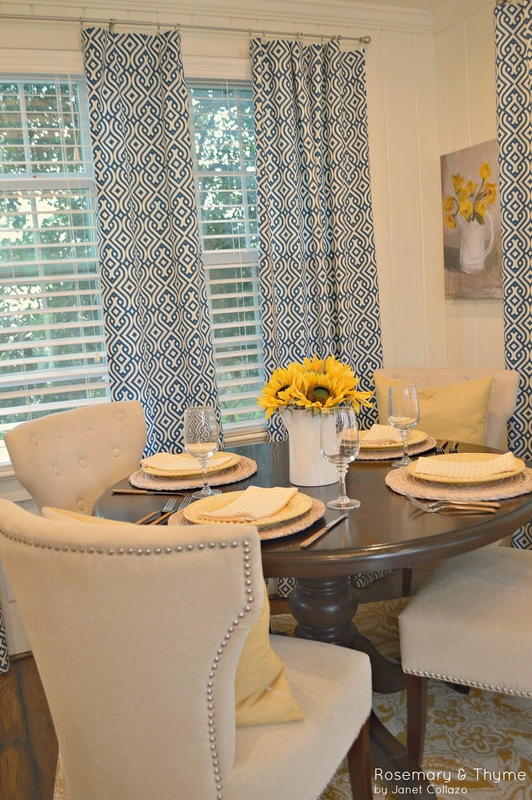 Remember, you do not need to buy everything new when you make over a room. 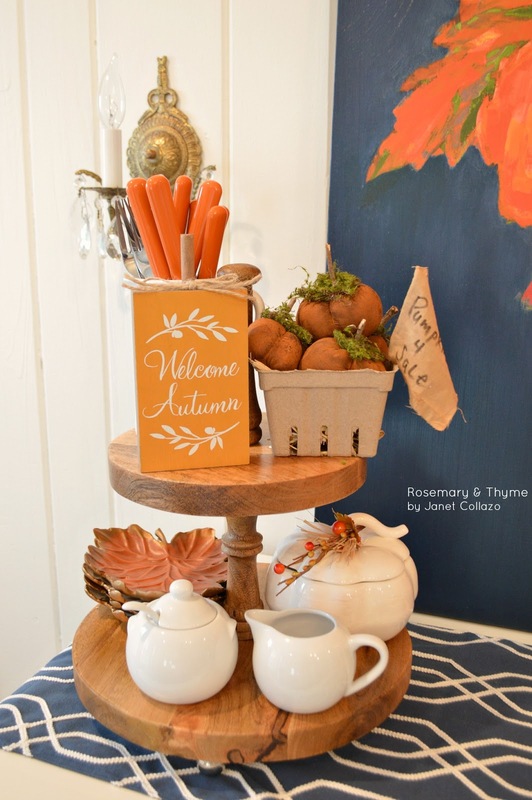 Re-purpose, paint and hunt for pieces at flea markets or thrift stores. You will achieve a truly unique and stylish interior if you step outside of your comfort zone. It looks beautiful now! I can see you enjoying spending lots of time in there. Thank you Carolyn. You are correct. We do spend lots of time in the Breakfast Room now. It is such a welcoming and cheery room now. Thank you for visiting. Have a great weekend. Thank you so much Cindy. What a wonderful compliment. It makes so happy to know that you like my makeover. And it would be a pleasure to have you join me for a cup of coffee in my new Breakfast Room. Thank you for visiting. Have a great weekend dear friend. Love the makeover! 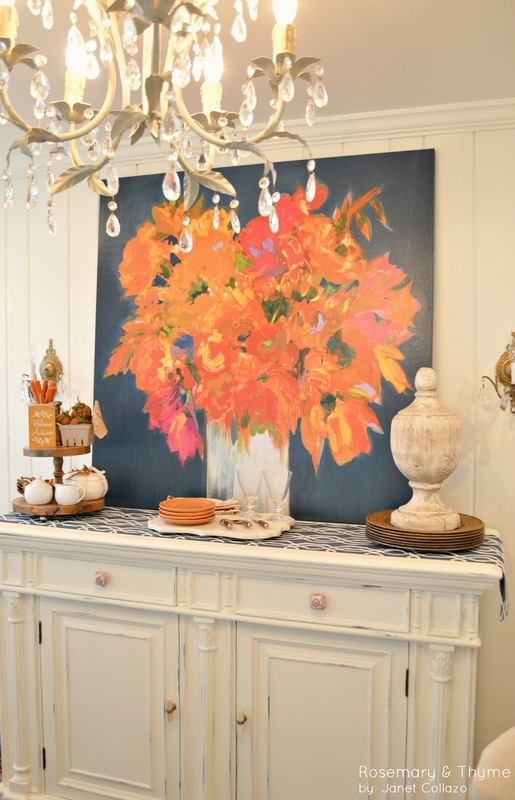 Did you wax the buffet after painting it? It looks great! Thanks for sharing. Thank you so much Janie. Yes, we did wax the buffet. Annie Sloan also. Wow, I love the update! You both did a great job. Thank you so much Nikki. I appreciate your visit and your kind words. Great job!! So fresh and airy!! Bravo!!! Thank you so much Rosie. I appreciate your visit and your kind words. What a REMARKABLE difference!!!!!!!!!!! It's just...wow!!!!! Lightening up cabinetry and walls can go SO far in making a room look so much more inviting. I have a "dungeon" room in our house that I'd like to makeover, but my husband resists. He's kind of a weirdo when it comes to redecorating overhauls. One day, though, he's just going to come home and find it all in progress. No turning back!!! :-) Great job! It looks fabulous! Have a great weekend! Thank you so much Alycia. You are so sweet. The makeover was long over do. I love spending my mornings in that room now. It is truly a pleasure to enjoy a cup of coffee there in the mornings. I hope you convince your hubby to do re-d0 your "dungeon" lol. Sometimes, they just need a little push. I appreciate your visit. Have a fabulous weekend. This is a wonderful room now! Looks like a lot of work went into this with the ceiling and the painting but it was well worth it. 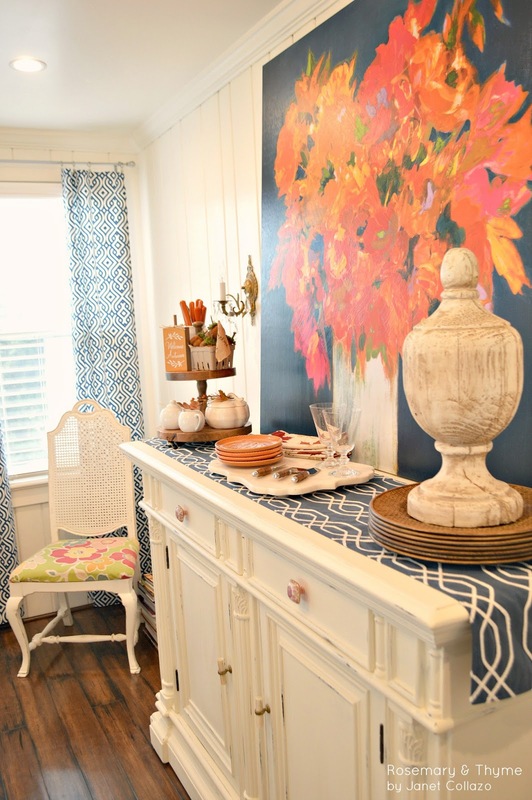 I love how you reused your table and chairs and painted the buffet. That huge piece of art is amazing! Wow Janet, what a job, but it sure was worth it! I love how bright and cheery it is. One of my daughters has a blue and yellow kitchen and it is just a happy combination. Thanks for sharing with SYC.